S B O supply custom printed banners and signs for many design firms and you can join in too!... It's easy... there are lots of options and within minutes you'll be supplying banners to your customers. At the Signs Banners Online website..., you can customize creative details, upload your custom design files, preview before approval, manage and track your items and watch as your order moves around the the factory and to your door. Shipping is everywhere and it's free. Supplying sign and banner printed displays is a great new way to make your firm better and it's easy to add this skill to your existing services. Customizable dimensions, material choices, full color prints and everything your client wants is at your fingertips ready for resale. For the graphic design company, sign company, advertising agency or first time wholesale buyer it's the perfect factory solution. 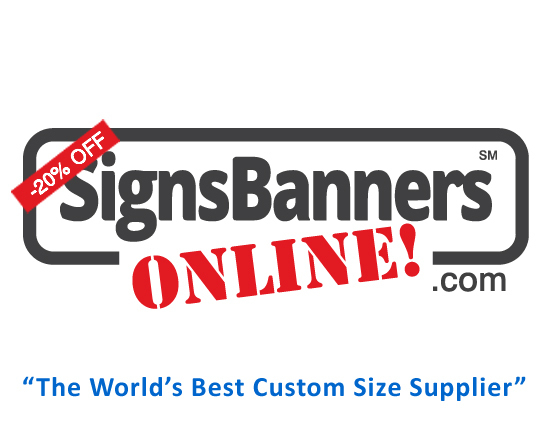 START NOW BY clicking the special 'designers support page' on Signs Banners Online dot com.